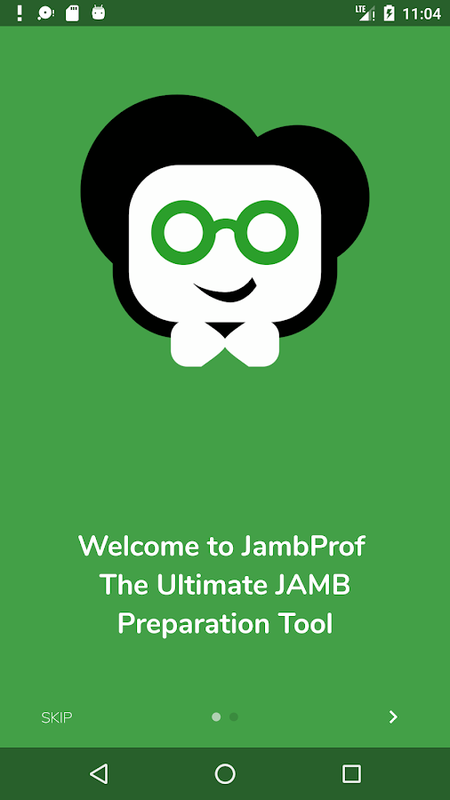 This is JAMBProf. The only JAMB preparation tool that isentirelyoffline and free (questions and answers, explanations etc).NoUPDATING, No ACTIVATING, NO bank payments, NO LIMITED QUESTIONS.15Subjects in all. Thousands of questions and answers. Abilitytosearch for questions using any number of keywords Questionshavebeen researched thoroughly from past questions and answerspluserrors have been corrected, mostly. You can also help byreportingquestions found that need correction right from within theapp.Great testing with flexibility - set your time and howmanyquestions to test yourself with. Includes JAMB novels in testsplusexplanations (SWEET SIXTEEN, IN DEPENDENCE, FORCADOS etc) Westriveto keep JAMB practice as "free" as possible. Only in apppurchaseis to remove Ads, as this app is ad-supported. Oyinbo Yoruba is a fun app that portrays a white lady speakingyoruba live! Simply enter your name and:- she will greet you inyoruba- she will announce callers in yoruba, if your name is Funke,she will say "Funke E ni call lati Funmi"in a foreign way.- shewill announce when the charger is removed and when the phone ischargingThis app does not claim to be fluent in Yoruba but ourOyinbo comes a bit close in a fun way for a first timer in Yoruba.It could help the aged to know who is calling and when the phone ischarging in a funny way! For best results ensure yourtext-to-speech engine is Pico.PLEASE DO NOT GIVE A BAD REVIEW ORRATING IF YOU DID NOT SETUP TEXT-TO-SPEECH PROPERLY ON YOUR DEVICE.ITS UNFAIR TO BLAME THIS APP FOR AN ISSUE CAUSED BY YOUR DEVICESETTINGS.You can setup TEXT-TO-SPEECH using the followingsteps:Android 4 upwards1. Go to Settings2. Language & input3.Text-to-speech output4. Select Pico and make sure it'senabled.Before Android 41. Go to Settings2. Voice input &output3. Text-to-speech output4. Select Pico and make sure it'senabled.PICO may not be installed, get it like this:Go to Settings-> Voice Input & Output -> Text-to-Speech settings >Pico TTS (Pico TTS settings) and then click on "Install voice data"and install the English "Pico TTS"
Mama Chef (Version 2 : Cooks and Soups) is the new version ofMamaChef with bold new recipes that come packed with coolpictures,beautifully laid out text and very nice presentation. Ahuge leapfrom the first version of Mama Chef.You will have recipes for just about every notable Nigerian Soup/dish you can think of that can make you a super Nigerian Chef!Over 24 beautiful dishes you don't ever want to miss! WithMamaChef - Cooks and Soups, the dishes are just a touch away!Recipes Include:Adalu (Beans & Corn)Afang SoupAsaro (Yam Porridge)AyamasheBeans (Regular & Ewa Aganyin)Dun Dun Oniyeri (Yamarita)EdikaikongEfo-Riro (Vegetable Stew)Egusi SoupEgusi Stew/SoupFrejon (Coconut Bean Dish)Ikokore (Water Yam Pottage)Ila-Asepo (Okra Soup)Ila Asepo (Version 2)Nigerian Fish Soup (Obe Eja)and over 10 more beautiful recipes to keep you in touch withNigerian soups and cooking endlessly...Highly improved user interface and presentation, all thankstothe people who bought the first version of Mama Chef,veryencouraging.No need to download anything from the internet, all recipesarefully built into your phone once installed!No Ads, never, at least for this version. Koya Turanci shi ne aikace ta farko da za ya taimake ku koyanturanci yanda ya kamata ba tare da kuna cikin aji'n karatu ba. Abunyi kawai shi ne,za ku taba kalma'n hausa a wayar ku,nan da nan zaku ji waya'n a takarce ya fadi kalma'n magana'n a turanci. Na yimaku godiya a ga me da afani da wana'n aikace'n ta mu,da fat'an zaku fahinta da kuma za ku ji dadi'n amfani da shi kamar yanda mu kaji dadi'n harda wana'n aikace'n ta mu.Da fat'an za ku ji dadi'n shilafiya.Samo cikake'n aikacen Koya Turanci - KoyaTuranci____________________________________________________________________________________KoyaTuranci is the best app to use if you want to learn how to speakproper English outside a classroom. All you need to do is touch theHausa words/phrases/clauses/sentences and you will hear your phonesay it instantly in English. Thank you for using this app, I hopeyou enjoy using it as much as we enjoyed making it! This is thefree version and as such it's limited in many ways, one of whichincludes advertisements.Get the full version, its CHEAPER THAN 1MEAL but worth more than 3 months in English school!Have awonderful time! Dads baby care is a simple app with information on how to take careof a baby - mainly for new dads - but of course anyone can learnfrom it too. It is all based on my experience and research.Remember, not all babies are the same but the tips in here willhelp the majority as I basically put in stuff you don't need tosearch for online and stuff you may not find online too!Everythinghas been upgraded in honor of those that donated for the DONATEversion of the app!This app is AD SUPPORTED. Don't like ads, thenget Dad's Baby Care (DONATE). This is the ad supported version of Mama Chef. This containsamazingNigerian recipes as per soups and dishes that go with yummyNigeriansoups, it also has a few other dishes.Get the full version of Mama Chef and get more recipes, nonagscreen and ABSOLUTELY NO ADS and internet use. This is the AD Supported version of Mama Chef Bake Boil or Fry -Your great source of Nigerian recipes that you can Bake Boil orFry, all within reach on your device.Internet connection required only for the ADs, recipes can beviewed without internet.Get the full version for more recipes and no Ads! Mama Chef - Bake, Boil or Fry (BBF) is thenewversion of Mama Chef that focuses solely on recipes thatinvolvemostly baking boiling and frying...No Soups here (Get "Mama Chef" for that). You will have recipesforjust about everything you can think of that can make you asuperNigerian Chef!Over 30 beautiful dishes you don't ever want to miss! WithMamaChef BBF the dishes are just a touch away!Recipes Include:Scotch EggsAkara (Fried Bean Cake)Baked Chicken BreastBaked Chicken Drumsticks & VeggiesBasic Home made BreadChicken YassaChin ChinCitrus Chili ChickenCoconut Crusted Baked ChickenCoconut Jollof RiceCoconut RiceFried PlantainsLiver and OnionsMoi Moi (Steamed Bean Pudding)Nigerian Breakfast Plantain & EggsWhole Tilapia (& Jollof Rice)and over 14 more beautiful recipes to keep you in touch withNigerian cooking endlessly...Highly improved user interface and presentation, all thankstothe people who bought the first version of Mama Chef,veryencouraging.No need to download anything from the internet, all recipesarefully built into your phone once installed!No Ads, never.